Bertha Lamme was the first female mechanical engineering graduate from the Ohio State University and the first woman to work in the industry at Westinghouse from 1893 to 1905. Lamme grew up on a farm in Springfield, Ohio in 1869. She attended public school and, according to Senator John Heinz History Center Chief Historian Anne Madarasz, education was important to her family. “Her family encouraged curiosity about the larger world,” Madarasz said. Her brother, Benjamin, attended the Ohio State University; graduating with an engineering degree the year Bertha finished high school. At the time, engineering was an industry reserved for men. For women to even consider studying mathematics or machines at college was inconceivable. Troy Eller English, Society of Women Engineers archivist, said some scholars maintained that if women entered higher education, they’d lose their “purity” and femininity. A screenshot of the Ohio State University alumni magazine describing the accomplishments of Bertha Lamme, who married fellow engineer Russell Feicht. But in the Midwest, land grant universities like OSU and Michigan State were more progressive and less likely to exclude women from entering traditional STEM fields. So Bertha Lamme followed in her brother’s footsteps, enrolling at OSU in 1889. She studied mechanical engineering with a specialty in a new field called electrical engineering. It wouldn’t have been easy for Lamme, even the schools that accepted women rarely accommodate the needs of their female students. There weren’t dormitories for women, so students often had to find off-campus housing. English said Lamme and a few peers lived together in the home of the sister of an OSU professor. Lamme was well liked at OSU, and active in student life. English said she was a member of the Browning Literary Society, a women’s theater organization. “Comments made about her in the student yearbook describes her as both ‘a compendium of universal knowledge,’ and also ‘The most peerless piece of earth that e’er the sun shone bright on,’ which is a line from Shakespeare’s ‘The Winter’s Tale,’” English said. The caption beneath a picture of Bertha Lamme at the Heinz History Center. Her senior thesis, called “An Analysis of Tests of a Westinghouse Railway Generator,” caught the attention of the Pittsburgh-based engineering company. Lamme was hired a few months after her graduation, joining her brother Benjamin, who was a rising star at Westinghouse. 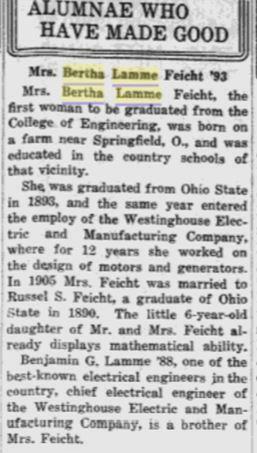 Her degree was in mechanical engineering because OSU didn't have an electrical engineering degree, but she worked as an electrical engineer. Historian Anne Madarasz said while there Lamme would have worked on some of the bigger transportation systems projects. Her brother was notable for designing the giant generators at Niagara Falls. The Westinghouse exhibit at the Heinz History Center in Pittsburgh's Strip District. George Westinghouse was known for allowing his engineers to take full credit for the patents they filed, unlike other inventors at the time, according to historian Anne Madarasz. “She’s in a place where there’s major innovation and change happening, new ideas that are going to impact the world,” Madarasz said. At work, Lamme would have used a slide rule, which is a mechanical analog calculator. Madarasz said she would have had an understanding of the “evolving theory of electricity,” as the technology was changing every day. Lamme spent 12 years with Westinghouse, but as progressive as Westinghouse was at the time for employing a woman, it was still standard for ladies to retire when they married. So when Lamme wed a fellow engineer, she left the company. Women in the field aren’t as rare an occurrence these days, but less than a quarter of all engineering degrees are earned by women. Madarasz said there’s still a ways to go to achieve equality within the field. “But I think she is a shining example of setting out on a path that few, if any, had trod before and succeeded,” she said. Lamme died in 1943 and is buried in Homewood Cemetery. At the History Center, there is a display dedicated to her in its Westinghouse exhibit. An introduction to WESA's profiles on women in Pittsburgh history with Gloria Forouzan, office manager for the mayor. *This story was updated at 10:10 a.m. on Jan. 30 to reflect the degree of Lamme. Many school districts across Pennsylvania say that budget stress is causing them to raise property taxes and cut school programs, according to an annual survey released by the Pennsylvania Association of School Business Officials and the Pennsylvania Association of School Administrators.